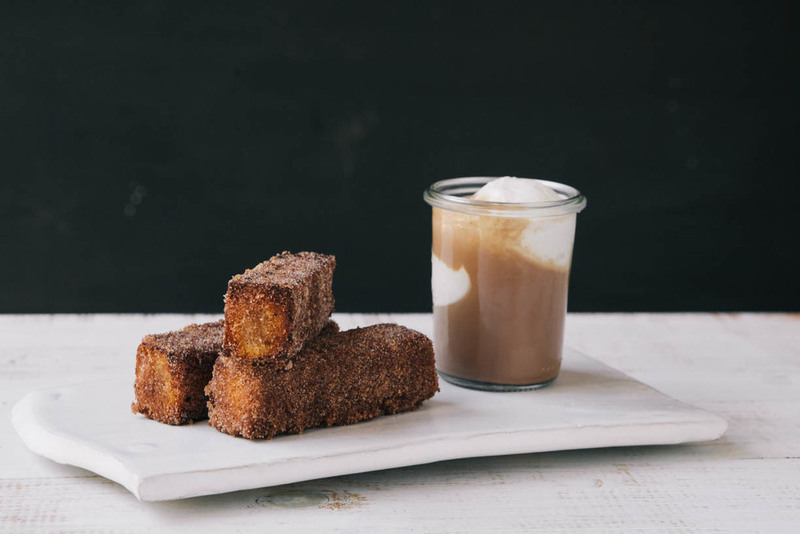 Pound Cake Churros — always with butter. When we were in LA, after a swim at Venice Beach, we went out to dinner at Roy Choi's restaurant A-Frame. Maybe it was the swimming, or the fact that I hadn't eaten all day long but that was one of the best meals I have had. The vegetarian option the 'Veggie Nest' was amazing. I ate it in about one minute. It was a bounty of seasonal vegetable prepared in all different ways. Pureed, fried, pickled, roasted, etc. My dream meal. I just read online that Roy Choi has a new vegetable-focused restaurant opening soon in LA. A must visit for me anytime I am somewhat near LA. To have a vegetarian option that wasn't a basic salad leaving me starved an hour after dinner, made me fall in love with A-Frame. Then we got dessert because we were all still hungry. The standout winner was the 'Chu-Don't-Know-Mang' pound cake churros, malted chocolate milk and vanilla ice cream. The cake was perfectly crunchy on the outside with a soft moist center. The chocolate milk tasted like melted ice cream. Everything was perfect about it. So when Adam was testing out recipes for him new chef job, recreating this was on the top of the list. Plus I think we just wanted to eat it again. So I made a pound cake one day while he was at a meeting. The next day we made the ice cream base and a few hours later spun it in my little red ice cream maker. Then the following we finally got to eat it. 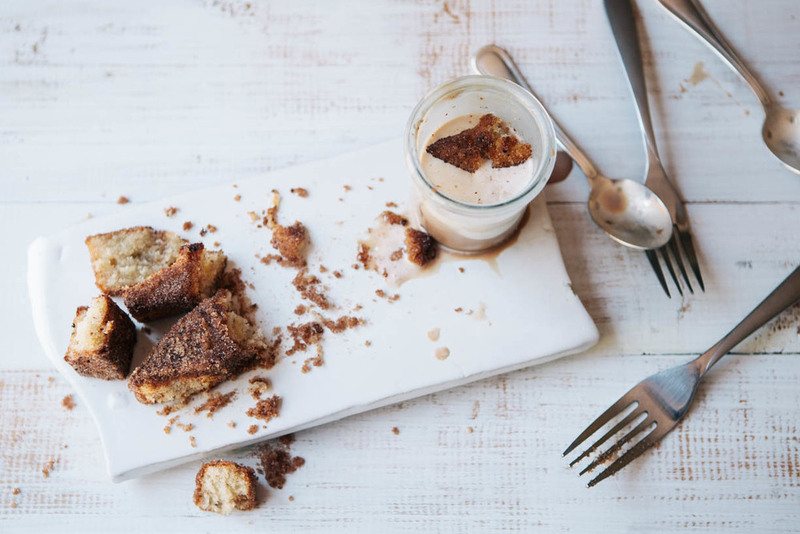 The cake was squared off and cut into rectangles, panfried then coated with cinnamon sugar. It took a try or two to get the oil the right temperature but after that, the churros we here. Just like I had remembered. Delectable. The chocolate milk we had made just didn't come out right, the chocolate was way too sweet and we added an extreme about of salt to it. Beat butter and sugar until very pale and fluffy, 5 minutes. Add in eggs gradually then vanilla. In a separate bowl, sift flour, baking soda and cinnamon. Add to batter and mix until no lumps. Mix in sour cream. Loaf pan bakes for 50 minutes until center is set and top of cake springs back when lightly pressed. Heat about 1/2 inch oil in a large skillet over medium heat. Cooking once cake stick at a time, fry on each side for about 45 seconds until golden brown. Let drain for on a paper towel for a few seconds then roll in cinnamon/sugar coating completely. Serve warm. Whisk together cornstarch and 55g milk. Set aside. In a saucepan, whisk cream, milk, sugar, syrup and salt. Bring to a boil over medium/high heat. Cook for 4 minutes then stir in cornstarch mix. Return to a boil and cook, stirring, until thickened, about 2 minutes. Place cream cheese in a bowl and pour in 1/4 cup hot mix, whisk until smooth. Then whisk into hot mix. Then whisk in malted milk powder Pour into a large ziplock bag and add place in fridge and let cool completely. Spin in ice cream maker. Then freeze until set.